The Amazon river dolphin is one of four families of river dolphins around the world, principally occupying rivers throughout Asia and South America. They come in a variety of colors and, in the Amazon, they come mainly in pink. A few things that differentiate them from other dolphins are their poor vision and their ability to turn their heads 180 degrees, which aids in maneuvering around in the muddied waters. Unfortunately, yet another difference is that they’ve been disappearing from the rivers of the Amazon in recent years. The Amazon dolphin’s nature is to be friendly and that has led to fishermen killing them in order to use their meat to catch large catfish which populate the rivers. There’s been an annual drop in their population of 7% per year, according to the Institute of Amazonian Research who has been studying the dolphins for close to 20 years. 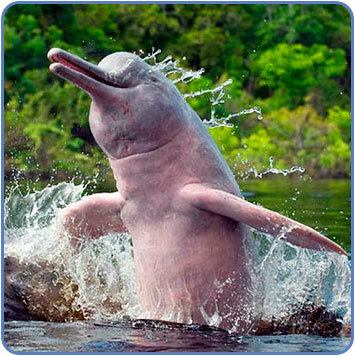 The other river dolphin families are also either being wiped out or have already been declared extinct in recent years. One side effect from their gradual disappearance is the lenda do boto, or Amazon dolphin legend, might disappear along with it. Among native inhabitants of the region, it is said that during the nights of the Festa Junina, these dolphins become charming young men who seduce unsuspecting young women and end up impregnating them. The next morning, they turn back into dolphins and disappear into the water. When a young woman turns up pregnant, others will speculate that it was a dolphin’s fault. And when a child doesn’t know their father, the response is…you guessed it, the dolphin did it. You can watch a short cartoon about the tale below.